The man whose body was found on a Santa Barbara beach on Saturday has been identified as former professional surfer and commercial fisherman Chris Brown, 48. At the age of 17, Brown won the juniors division of the 1988 World Amateur Surfing Championships held in Puerto Rico. He turned pro shortly thereafter and was one of a few surfers who could challenge Kelly Slater, now widely considered the best competitive surfer in history. 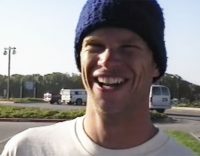 Brown ranked among the top 25 professional surfers in the world in the early 1990s. On Saturday afternoon, authorities found Brown’s dead body just above the shoreline about a mile away from Hendry’s Beach. It is unclear where Brown died and how his body arrived at the beach. Detectives and forensics teams had been trying to determine if there were any signs of foul play. An investigation into Brown’s death is ongoing.